Building on three decades of technology development, Wolfram Development Platform brings the revolutionary capabilities of the Wolfram Language to bear on creating and deploying production software systems and applications. With its philosophy of building in vast algorithmic and knowledge resources, and its commitment to maximum automation, the Wolfram Language dramatically changes the economics and possibilities of programming. And with its Universal Deployment System, anything you create can instantly be deployed through API, web, mobile, embedded code and more. By leveraging the Wolfram technology stack, Wolfram Development Platform makes it possible for you to develop and deploy a useful application in minutes—and build a major production system in days or weeks. The Wolfram Language makes as much as possible automatic: you write a little code, and it automatically selects algorithms, organizes data, creates interfaces, optimizes presentation and sets up production deployment. Because the Wolfram Language is interactive, you can run your code as soon as you write it, and because it's symbolic every fragment of code is instantly runnable—so it's easy to build up any program incrementally. A single line of code in the Wolfram Language routinely achieves what would take hundreds of lines in traditional languages, if it could be done at all. And the Wolfram Language code is elegant and readable too. Wolfram Development Platform lets you write your code in Wolfram Computational Notebooks, with text, graphics and interactive interfaces all directly integrated with your runnable code in a richly structured document. Wolfram technology has been used for years in some of world's most complex and demanding computational environments—and the structure of the Wolfram Language has made possible a new generation of highly optimized algorithms. With Wolfram Development Platform, you can instantly deploy your programs in the cloud, creating APIs, interactive web content, mobile apps and much more. 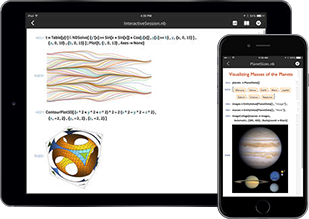 The Wolfram Language incorporates the world's largest web of algorithms—as well as the vast Wolfram Knowledgebase used in Wolfram|Alpha—and makes everything instantly accessible in your programs. In the Wolfram Language most of the primitives are about images or networks or cities—not low-level machine operations. The Wolfram Language has integrated natural language understanding—the same technology as Wolfram|Alpha—so your programs can take natural language input, and you can use natural language to help write your programs too. 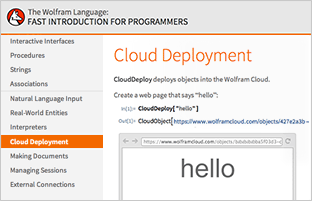 Wolfram Development Platform lets you write, test and deploy your code directly in the cloud through any web browser. There's also a complete desktop interface that seamlessly connects with the cloud. Use the Wolfram Cloud mobile app to view, edit and interact with your deployments on mobile. Write, test and deploy your code when and where it works for you. The philosophy of the Wolfram Language is to build in and automate as much functionality and knowledge as possible—so you can concentrate on what you want your program to do, not how the program should do it. 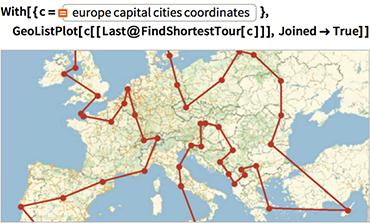 Instantly expose any Wolfram Language code to be called by a Web API from anywhere on the web. Run Wolfram Language code dynamically in the Wolfram Cloud whenever a URL is accessed. Instantly set up richly structured forms to call any Wolfram Language code—using Wolfram Smart Fields to allow natural language input wherever you want. Wolfram Development Platform generates code to call Instant APIs from a wide range of languages. Use notebooks to deploy Wolfram Language interactive content directly in the Wolfram Cloud. Immediately embed forms or content built with Wolfram Development Platform into any web page. 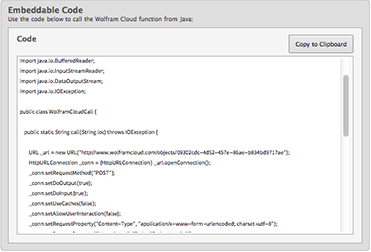 Conveniently call any Instant API in the Wolfram Cloud from inside your web code. Since the Wolfram Language has a programmable symbolic representation of its own deployment, you can "script" and automate arbitrarily sophisticated deployment scenarios. The Wolfram Language doesn't just make programming much more efficient—it also dramatically raises the bar on what it's realistically possible to make a program to do. Because everything in the Wolfram Language is coherently built in, you can routinely combine functionality from vastly different areas, opening up a new level of programming and algorithm innovation. The Wolfram Language makes it trivial to insert aesthetically optimized static or dynamic visualization anywhere—bringing any aspect of your program to life. In the Wolfram Language, data and models from thousands of domains are built in, so your code can immediately know about and compute with real-world constructs. The design and automation of the Wolfram Language makes using advanced computer science methods and data structures routine—even if you never took classes about them. The Wolfram Language supports a unique programming methodology based on transformations for symbolic patterns that allows large-scale declarative programs to be created in an exceptionally flexible and expressive way. The Wolfram Language has access to the whole linguistic system used in Wolfram|Alpha—so you can immediately make your program understand natural language. Because the Wolfram Language is symbolic, you can write programs that manipulate and generate code programmatically. Wolfram Language code is concise, readable and—because it's symbolic—always modular and interoperable, so it's easy take code you read (say in the 100,000+ reference examples) and immediately use it in your programs. The symbolic nature of the Wolfram Language lets you make your code manipulate anything—data, images, documents, interfaces, code and structure, as well as content. With the Wolfram Language, the symbolic character of the language lets you create arbitrarily complex interactive documents—and interfaces—programmatically. A key achievement of the Wolfram Language across many areas is taking research-level methods and automating them to the point that they can routinely be used by non-experts as parts of programs they write. Modern functional programming—with major symbolic extensions—is built right into the core of the Wolfram Language. Part of the Wolfram Language is a new symbolic approach to databases that combines SQL and hierarchical styles, and introduces an unprecedentedly easy functional-style symbolic interface. Because everything has the same symbolic character, the Wolfram Language lets you seamlessly build up as many layers of structure as you want, mixing code and data, and routinely passing layers of structure like data. Wolfram Development Platform is set up to support projects and businesses of all sizes—from startups to large-scale enterprises—and to provide a convenient and robust programming and deployment environment. The core infrastructure of Wolfram Development Platform has been battle-tested for years in Wolfram's widely used public Wolfram|Alpha system. The knowledge-based Wolfram Language dramatically changes the economics of programming by automating many programming tasks and letting programmers start from a very high-level platform of built-in capabilities. Wolfram Solutions has a distinguished history of providing outstanding solutions to top organizations around the world. The Wolfram Technical Services Group also provides hourly project consulting. Wolfram Development Platform is set up to interoperate with standard web systems and code, supporting editing of web assets, as well as sophisticated programmatic templating of web content. Many great businesses can be built with just the right few lines of Wolfram Language code. But if you need to, you can also create Wolfram Language programs that are millions of lines long, like Wolfram|Alpha. The Wolfram Language has built-in, fully scriptable verification testing and analysis capabilities, so it's easy to validate your code and set up sophisticated software quality assurance procedures. Wolfram Development Platform has versioning built in, as well as interoperating with Wolfram Workbench, which provides an Eclipse-based IDE that supports popular source-code control systems. When you deploy in the Wolfram Cloud, everything your users do can be logged and passed into the Wolfram Language for immediate analysis or visualization—and used to create real-time dashboards or reports, or for sophisticated algorithmic data mining. Wolfram Development Platform is set up to be able to create both standalone applications and components that use APIs, etc., to fit conveniently into modern software engineering ecosystems. A whole generation of technical students has been exposed to the Wolfram Language through its history in Mathematica—and today there is a vibrant community from which to recruit Wolfram Language programmers. It's fun to write Wolfram Language code... partly because a little goes such a long way, and partly because you can always run it interactively at any stage and see it working—and you can make nice interfaces and images from it. Wolfram Development Platform can automatically generate code in many languages to call Wolfram Language code you create—and you can call code in other languages from within the Wolfram Language too. By being so high level, Wolfram Language code tends to be short and easy to read—and it's usually written in notebooks that include examples and documentation, and in which any piece of code can immediately be run and tested. Wolfram Development Platform lets you set up workgroups to share code, as well as gives you detailed programmatic control over how and to whom your code is deployed. Because it's symbolic, the Wolfram Language treats code just like data, and lets you take your codebase and apply refactoring or other transformations, as well as do visualizations and analyses using sophisticated graph theory and other methods. 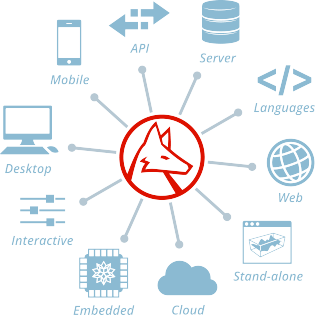 Wolfram Development Platform is available in a private cloud configuration, which can be operated securely inside your organization's infrastructure.